It's always been my problem how to arrange our books in such a way that it will not look cluttered and that when my kids will take one or two the others won't be that affected. I bought plenty of heavy duty book ends last June but it didn't help in keeping the books in perfect line. I must admit that I'm too busy now to arrange them on a daily basis. I want something that will be easy for my kids and at the same time be very functional and stylish as well. Seeing the above picture makes me fancy a different kind of storage display for our books and I will ask my brother-in-law to do this kind for us. He's an expert in making little home furniture and I'm sure this will be easy for him. 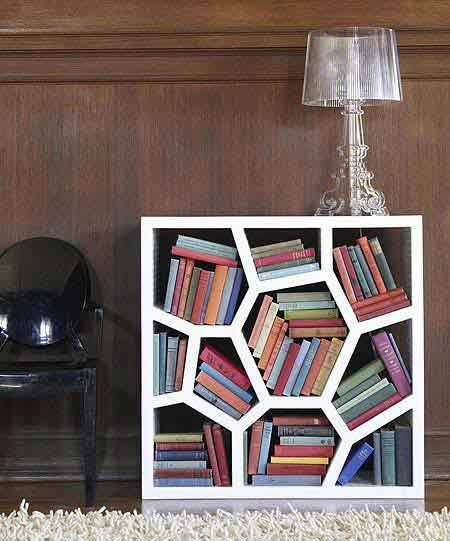 So now my kids and even me will not be so worried about organizing our books as having this kind of book case will be a great help and a nice home decor too. Have fun reading! That shelf is so nice!